Portland, OR (USA) -- Have you ever wondered what happens when you die? In seventh century China, everyone went to hell. Ten times. While their loved ones watched. "When somebody dies, they would ask for the scrolls to be hung up, usually close to the coffin," said K.E. Brashier, associate professor of religion and humanities at Reed College in a phone interview from Portland. "You'd be able to chart the afterlife process of this deceased person, so through rebirth, they have to go through 10 levels of hell." Nearly 1,500 years ago, the Jade Emperor was said to have ordered the execution of a river dragon, who asked Emperor Taizong of the Tang Dynasty to try to save him. Though Taizong tried, he failed and the dragon was beheaded. Furious, the dragon dragged Taizong, who was in a delirious and dream-like state, to the hell courts to pay for his betrayal. Taizong's charges were cleared, but he had seen unspeakable horrors in hell and was told to record them all for posterity. 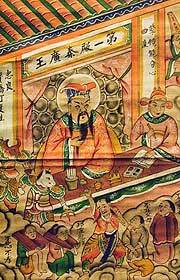 Taizong's Hell Scrolls were karmic; before being reincarnated, people had to pass through the levels of hell to pay for their lives' sins. Despite the subject matter's severity, the Hell Scrolls are comic book-like in appearance, colorfully depicted with ink on paper. A set from the 19th century is hanging in the University's Jordan Schnitzer Museum of Art for "Marketplace Morality - Chinese Hell Scrolls," a lecture to be given tonight by Brashier, who is working on an educational project and database regarding the scrolls. "It's interesting to be able to view other people's ideas of paradise and hell, and how they relate to the Buddhist religion," said JMSA Director of Communication Erick Hoffman. Charles Lachman, an associate professor in the department of art history specializing in Chinese Buddhist art, said the Hell Scrolls are interesting because they're so macabre. "There's some fantastic hell images from the 19th century and they're very beautiful paintings even though they depict horrible things," he said, noting the scrolls' contrast. Lachman's favorite scroll is the 10th, which represents the final level of hell. Sinners' sentences end as they are granted rebirth, their memories erased of the horrors they have endured. It's his favorite because there are several different versions and not just one definitive design. "These weren't viewed as individual, unique things, so in that sense, they're different from a lot of other kinds of art," he said. In the fourth scroll, the Hell of King Wu Guan, those who had exhibited two-faced behavior were pushed off the bridge of no return by spear-wielding demons with ox heads. In the Hell of King Bian Cheng, women of ill repute were banished to the pool of blood and filth; however, good deeds, such as releasing an animal intended for slaughter, were rewarded. Brashier compares people in previous centuries' fascination with the scrolls to the modern interest in horror movies. "They're so gross and disgusting but you can't not look at them," he said. He also finds them interesting as a theologian. He said seeing what offenses were punishable by torture, such as gossiping and cheating weights at the marketplace, can teach someone a lot about ancient Buddhism and its values. "I would describe (the scrolls) as an educational experience on the afterlife in the sense that you can imagine a mother taking her child in and giving that child sort of a morality play," he said. "It's not just art, it's meant to be education in its own right."